When Wilkinsons gave me the chance to review an item from their new Summer range I really was spoilt for choice. They have a great online catalogue which is actually laid out more in the style of a magazine, which I enjoyed flicking through, clicking on a photo takes you straight to the product for more information. I settled on the miniature glass house which retails at £15.00, well with the lack of sun in the garden I thought the plants could do with a helping hand. The Terrarium arrived from Wilko.com it is made from glass and metal complete with ornate handle so it can be moved, it was well packaged, the glass protected all safe and secure. It has a hinged lid, and any water from either rain or when you water your plants drains out the bottom. It is nice and light weight, even though its made of glass and metal. I had thought to keep some herbs in the glasshouse. In previous years I have always lost my Basil once I pot it outside of the greenhouse, so thought this would be ideal to hopefully achieve some success with them this year. In a week or two the tiny seedlings growing in the greenhouse will be ready for a new home. 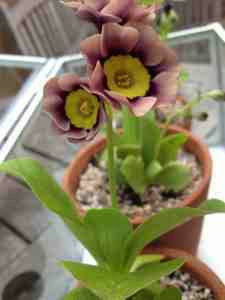 But with the colder weather we have had of late I decided to pop a few of my Aricula plants inside. Protected from the wind and rain they have done really well and already in bloom. It would be great if one of the glass planes could slide so you can let some of the heat out without the need to open the lid. Will share a photo of my Basil once they have settled in. I was sent the Glass Terrarium for the purposes of this review, all opinions are my own.